Luxury Penthouse in Conil de la Frontera - Breathtaking Sea views. New built (2010). Excellent and exclusive views 180º to Conil meadow and to Atlantic Ocean. In new and modern 12 apartments building. Gardens and Private pool (salt water). High quality finishing. Tumbled marble throughout the house, terrace and tiling in bathroom, electric blinds, PVC carpentry 6+12 +6. Fully equipped kitchen, bedroom and bathroom. Flat TV freeview Satellite, WiFi 20Mb, Independent Air Conditioning and Heating. Solar energy. Parking on Request. BBQ and Canvas on terrace. In a very quiet area near the beach and town. Very well connected around the Shire. From terraces can see the meadow of Conil and Castilnovo beach and the watchtower. Castilnovo watchtower was built in the sixteenth century by the sixth Duke of Medina Sidonia, against a possible attack Muslim-Berber. From the terraces can also be seen, on clear days, the coast of North Africa (Morocco-Cap Spartel-). Drive to Tarifa (40 minutes), there can catch a ferry to Tangier, and in just 35 minutes voyage through the Strait of Gibraltar ....;-) you will be in Africa. From terraces can also see Trafalgar LightHouse, which reminds us of the famous battle in which Admiral Nelson defeated the French-Spanish fleet in the called 'Largest Naval Battle of history', in 1805. From this apartment you have an easy access to almost all the beaches of the region 'La Janda', our complex is in the center of the region. To the North of Conil, the beaches of 'La Barrosa' and 'Roche', Conil Coves ('Cala del Aceite', 'Cala Encendida', etc..) (5Km). Just in front of this apartment - The beaches: Playa de los Bateles or Conil' (800mts) and 'Playa de Castilnovo', (800mts) where water Sports are practiced in the River Salado. Bateles Beach is to the north of River Salado, it's Conil beach, it is wide and has all the services, bars and it is close to the town. Castilnovo beach is a Virgin Beach from 'Salado' River to the south, in an area called Prado de Conil. Prado de Conil is a meadow that has an special environmental protection. The cattle graze and 'Sunflower' is cultivate in summer. Bird watching or hunting with Greyhounds are activities that take place in winter in Prado de Conil. Here you can also visit the mill and wine organic cellar, called 'Sancha Pérez' (1Km). All these can be seen from the terrace of MARINA 1. The Beach 'Playa del Palmar' is 3 Km to the south, in this beach Surfing, Kite-Sur, Paddle and and other water Sports are practiced. Interesting towns to visit are those of Vejer de la Frontera and Medina Sidonia. Distance: - 73 Km (45 miles) - Time: 52 min. - Total Cost: 8,54€ (10,00 GBP) Petrol+Toll. Distance: - 206 Km (128 miles) - Time: 2,57 hours - Total Cost: 34,20€ (23,11GBP) Petrol+Toll. Distance: - 160 Km (100 miles) - Time: 1h 55m - Total Cost: 25,63€ (24,46 GBP) Petrol+Toll. Distance: - 97 Km (60 miles) - Time: 1h 41m - Total Cost: 12,66 € (15,00 GBP) Petrol+Toll. Excellent and exclusive views of the Prado de Conil and the Atlantic Ocean, Playa del Palmar. For 2 or 3 people. In building new modern 12 houses with gardens and private pool. Finished in very high quality. Marble throughout the house, terrace and tiling in bathrooms, electric blinds, PVC carpentry 6 +12 +6. Fully equipped kitchen, bedroom and bathroom. Flat TV Freeview, Satellite, WiFi 10Mb, AC in living room and bedroom, solar energy independent. Chance Garage. In quiet area near the town beach and the apartment you will like very much for your excellent views. All our tenants are chosen, very quiet and polite people. We try to make the complex a relaxed and comfortable vacation spot for all our customers. No smoking, no pets allowed. This apartment is in a modern building, comprising 12 apartments, situated in a new urbanization secure and quiet and very near the center of the town and the beach. Perfectly located at the entrance to Conil from the motorway A-48, in an strategic location for trips to the whole region of the Janda. The entrance to each apartment is independent. 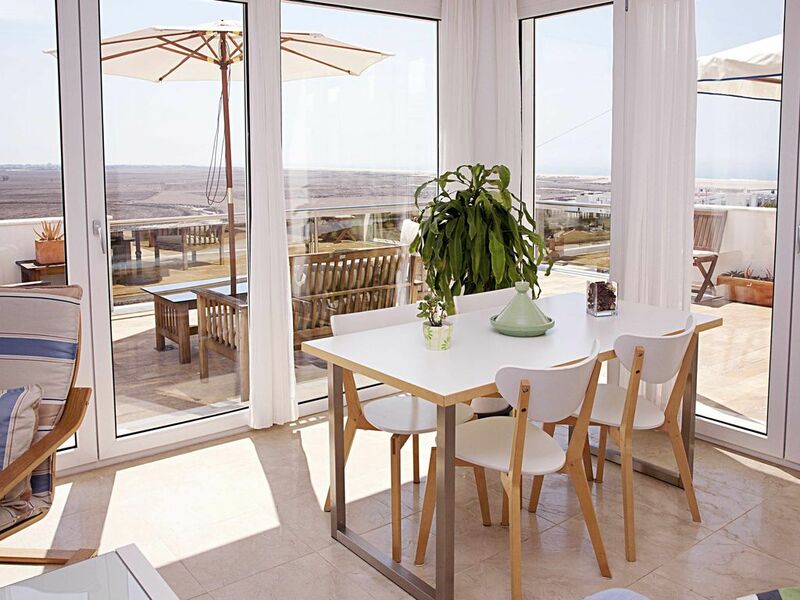 All apartments have south facing furnished terraces with breathtaking views. With gardens, seawater pool. The resort is a quiet and comfortable place, built to high standards. El precio es para 2 Adultos. Juego extra de Toallas y sábanas: 15,00€. Cuna y Trona bajo petición: 20,00€/semana. Limpieza extra: 15,00€/h. Descuentos para estancias de larga duración. El precio Incluye: - Juego de sabanas por cama y semana. - Juego de toallas por persona. - Luz, agua e impuestos. - WIFI y aire acondicionado. - IVA e impuestos. Reserva: 20%. Fianza: 200€ La fianza garantiza el buen uso y utilización de los enseres e instalaciones de la vivienda. Tanto el continente como el contenido se encuentran asegurados con compañías aseguradoras. Pedimos un depósito por la suma de € 200, - que le será devuelto después de su salida, en un plazo máximo de 10 días por transferencia a la cuenta de la reserva. Condiciones de nuestro alojamiento: www.miradordelprado.es INFORMACION ADICIONAL Todos los precios incluyen: todos los servicios públicos, impuestos locales, limpieza final de 4 horas al precio de 15€/hora, toallas y ropa de cama. Wi-Fi a Internet, uso de la piscina y zona ajardinada de forma gratuita. Disponemos de cuna y trona para niños menores mediante solicitud previa. Se pueden solicitar servicios adicionales de limpieza y/o guardería. Después de confirmar su reserva, usted recibirá toda la información relevante (confirmación, dirección y plano de ubicación), la información general sobre los apartamentos y las condiciones de alojamiento, se encuentra en nuestra web www.miradordelprado.es. Suministramos información turística de los alrededores y recomendaciones en la zona. Para estancias de más duración en temporada baja, solicite un presupuesto !